One of the oldest Sephardic families. It continued in Spain and in Spanish possessions long after 1492, the year of the general expulsion. Many members of the family and its connections undoubtedly succeeded that year in joining the Jews ofAquitaine. Others drifted to Holland, Italy, Turkey, etc. The French or Aquitaine branch settled chiefly in Bordeaux, Bayonne, and Came. It inter-married with such old families as Pereira, Da Costa, Gomez, Vaez, Osorio, Sola, Sespedes, Capote, Quiros, Henriques, Soares, Casado, Morro, Bonito, Fonsequa, Nunes, Corcho, Netto, etc. Among Bayonne notables of this family may be mentioned Edouard Mendes (member of the municipal council, president of the tribunal of commerce, chevalier of the Legion of Honor), Auguste Mendes ("inspecteur des postes"), and Elysée Mendes (member of the tribunal of commerce and of municipal council). The earliest Mendes tombstone now in existence in Bayonne is that of Rodrigues Mendes (1637). The Holland branch produced some notable writers, such as David, son of Atalyah Franco Mendes (author of "Gemul 'Atalyah," "Ḥanukkat ha-Bayit," "Peri 'Eẓ Ḥayyim," "Teshu'ot Yisrael"), Samuel Rodrigues Mendes, and Samuel da Silva Mendes (authors or editors of editions of the Sephardic ritual on which the modern editions of David Levi, Meldola de Sola, Leeser, and Gaster are based). The West-Indian or American branch springs from David Pereira Mendes, who fled from Spain to Bayonne and who arrived in Jamaica in 1786. He died the same year, leaving one son, Samuel. This son had twelve children, from one of whom, Isaac, were descended Joseph and Abraham. Joseph was the father of Isaac Philipe and four daughters. Abraham was the father of Frederick de Sola Mendes and Henry Pereira Mendes. English rabbi and educationist; born in Kingston, Jamaica, Feb. 9, 1825; died in New York April 18, 1893. He was the first master of the Beth Limud School of Kingston, but resigned in order to prepare in London, England, for the vocation of preacher and rabbi. He studied under Dr. Meldola, the dayyan, and the Rev. D. A. de Sola, "the learned ḥazzan" of the Sephardic community, and received his diplomas. He returned to Jamaica and became for a short time assistant to the Rev. Isaac Lopez, minister of the Kingston Sephardic congregation, but was soon called from that position to be the minister of the Montego Bay community. There he stayed until his wife's failing health compelled him, in 1851, to return to her milder native climate. Mendes was then elected minister and preacher in the Birmingham (Eng.) congregation, and remained there until 1858, when he removed to London, became head of the Neveh Zedek for six years, and established Northwick College, a school for Jewish youth. He continued meanwhile his ministerial duties and literary labors, and on the death of Haham Artom acted as preacher and dayyan for the Sephardic community of London. He was called to the ministry in the Newport (Rhode Island) congregation by the guardian congregation Shearith Israel of New York in 1883, and continued its minister until his death ten years later. He was the first among the Sephardim to publish a volume of sermons in English (1855). He translated the Daily Prayer-Book of the German Jews (Valentine's edition), and finished the translation of the Festival and Holy Day Books left incomplete by the death of Rev. D. A. de Sola. He published, besides, "The Law of Moses," "Post-Biblical History of the Jews" (to fall of Jerusalem), "Interlineary Translation of the Prayer-Book" (German), and the Haggadah. He married Eliza, a daughter of Rev. D. A. de Sola of London. American rabbi, author, and editor; born at Montego Bay, Jamaica, West Indies, July 8, 1850; son of R. Abraham Pereira Mendes. He was educated at Northwick College and at University College School, London, and at London University (B.A. 1869). Subsequently he went to Breslau, Germany, where he entered the university and studied rabbinics at the Jewish Theological Seminary. 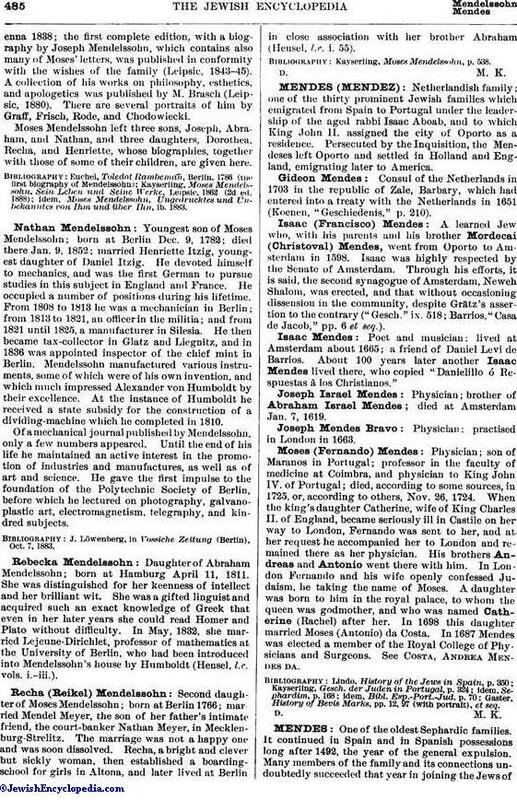 Mendes received the degree of Ph.D. from Jena University in 1871. Returning to England, he was licensed to preach as rabbi by Haham Benjamin Artom, in London, 1873; in the same year he was appointed preacher of the Great St. Helen's Synagogue of that city, but in December removed to New York, where he had accepted a call to the rabbinate of Shaaray Tefillah congregation (now the West End Synagogue); he entered upon his duties there Jan. 1, 1874. Mendes was one of the founders of the American Hebrew. In 1888 he took part in the Field-Ingersoll controversy, writing for the "North American Review" an article entitled "In Defense of Jehovah." 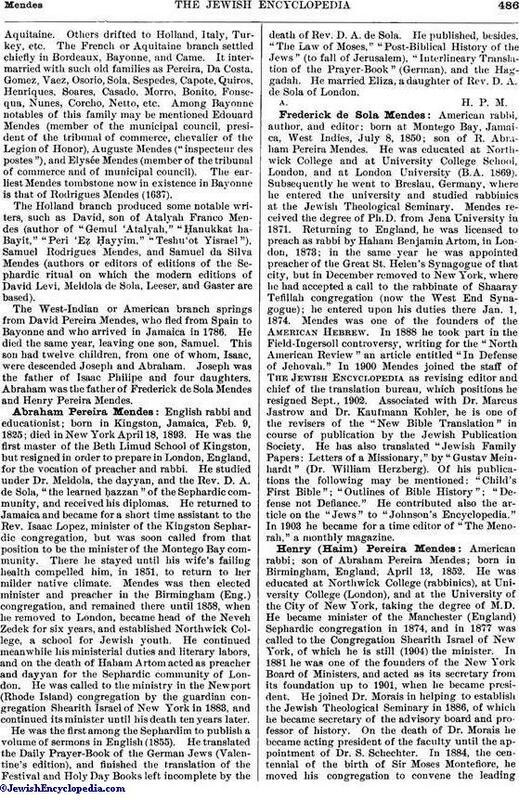 In 1900 Mendes joined the staff of The Jewish Encyclopedia as revising editor and chief of the translation bureau, which positions he resigned Sept., 1902. Associated with Dr. Marcus Jastrow and Dr. Kaufmann Kohler, he is one of the revisers of the "New Bible Translation" in course of publication by the Jewish Publication Society. He has also translated "Jewish Family Papers: Letters of a Missionary," by "Gustav Meinhardt" (Dr. William Herzberg). Of his publications the following may be mentioned: "Child's First Bible"; "Outlines of Bible History"; "Defense not Defiance." He contributed also the article on the "Jews" to "Johnson's Encyclopedia." In 1903 he became for a time editor of "The Menorah," a monthly magazine. American rabbi; son of Abraham Pereira Mendes; born in Birmingham, England, April 13, 1852. He was educated at Northwick College (rabbinics), at University College (London), and at the University of the City of New York, taking the degree of M.D. He became minister of the Manchester (England) Sephardic congregation in 1874, and in 1877 was called to the Congregation Shearith Israel of New York, of which he is still (1904) the minister. In 1881 he was one of the founders of the New York Board of Ministers, and acted as its secretary from its foundation up to 1901, when he became president. He joined Dr. Morais in helping to establish the Jewish Theological Seminary in 1886, of which he became secretary of the advisory board and professor of history. On the death of Dr. Morais he became acting president of the faculty until the appointment of Dr. S. Schechter. In 1884, the centennial of the birth of Sir Moses Montefiore, he moved his congregation to convene the leadingJews of New York to mark the event by some practical work: the outcome was the Montefiore Home for Chronic Invalids, established in the same year. He was made vice-president of the Gild for Crippled Children in 1896, and in 1901 established the Jewish branch of that gild. He promoted the formation of the Union of Orthodox Congregations of the United States and Canada (1897) and was subsequently elected its president. Mendes was one of the founders of the Young Women's Hebrew Association of New York (1902), of whose advisory board he is chairman. In Zionism, Mendes stands specially for its spiritual aspect; he served as vice-president of the American Federation of Zionists and was a member of the Actions Committee of Vienna (1898-99). The degree of D.D. was conferred upon him by the Jewish Theological Seminary of America (1904). 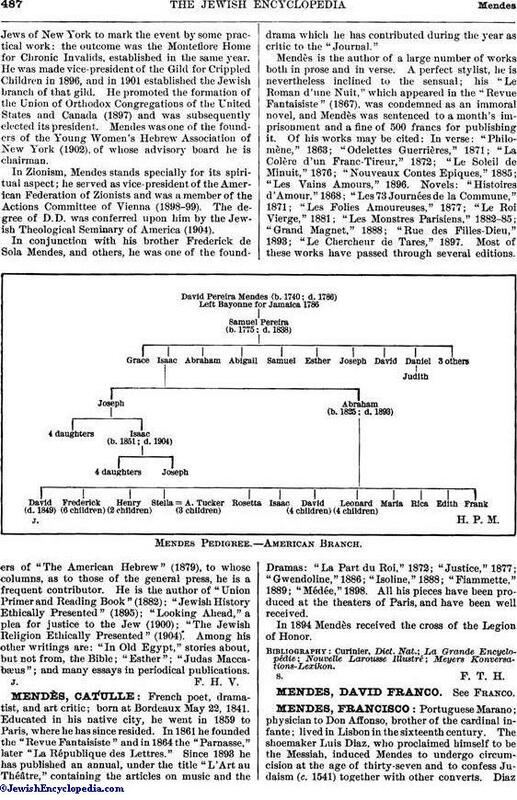 In conjunction with his brother Frederick de Sola Mendes, and others, he was one of the founders of "The American Hebrew" (1879), to whose columns, as to those of the general press, he is a frequent contributor. He is the author of "Union Primer and Reading Book" (1882); "Jewish Hisṭory Ethically Presented" (1895); "Looking Ahead," a plea for justice to the Jew (1900); "The Jewish Religion Ethically Presented" (1904). Among his other writings are: "In Old Egypt," stories about, but not from, the Bible; "Esther"; "Judas Maccabæus"; and many essays in periodical publications.